Difference between revisions of "Game Help:Back Ups"
The figure I’ve highlighted in red is the one you’re interested in- if you have a lot of custom content this can be vast! 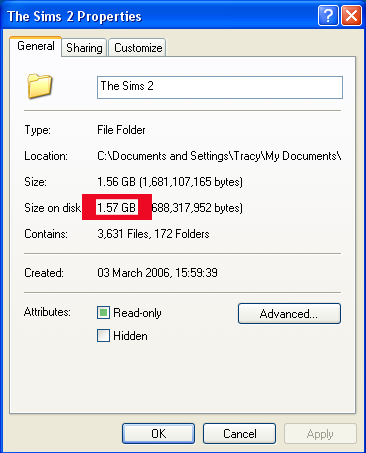 If you have more free space on your hard disc than your Sims2 folder takes up, you can choose any option. If you have around 75% or more you could save to hard drive by Zip or Rar; if you have around 50% or more, you could save to hard drive by Rar. If you have less than 50% you should save to CD or DVD, or free up some hard disc space. 1 How do I back up my game files, and restore backed-up files? 2.1 How do I create the backup? How do I back up my game files, and restore backed-up files? Why should I back up my files? Before you make any changes or repairs to your computer, or install a new expansion pack you should back up your game files so that your sims will not be lost. It is also a good idea to back up these files periodically in case something goes wrong, or in case you want to test new hacks or transfer the files to a different computer. The data and programming which form the core of the game are kept in C:\ Program Files\ EA Games by default, and normally are never modified. The only time these would be changed are if you wished to make configuration changes relevant to a hack or mod. The User data files and savegames are kept in (C:\ Documents and settings\ Login Name\) My Documents\ EA Games\ The Sims 2 and are changed as you play the game. Your screenshots, neighbourhoods and downloads are all kept here, and it is this information we are interested in backing up. If you need to restore a backup or transfer the files to another computer, you need to copy the files back to (C:\ Documents and settings\ Login Name\) My Documents\ EA Games\ The Sims 2. The following explains the procedure for doing this in detail. How do I create the backup? Explorer Copy: You can copy your files to another part of your hard drive, or to a spare hard drive if you have one. You could also compress the information (Zip or Rar) to save space. CD/ DVD Copy: You can copy your files to a CD or DVD for storage, or for moving to another computer. If you are backing up because you wish to have a copy off your hard drive for some reason (for example, computer maintenance or moving to a different computer), you should back up to CD or DVD. If you are backing up so that you can test new hacks or just because you wish to save your families, you could backup either to CD, DVD or hard drive. 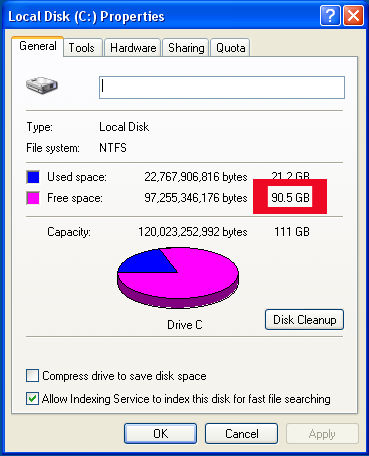 You need to make sure you have enough space on your computer if you wish to save to hard disc. Click the Start button and My computer, and right click on the drive with your documents on it- this is usually drive C. Select Properties. The ‘Free Space’ figure that I’ve highlighted in red is the one you’re interested. Write this figure down. It is usually in Gb- a Gb is just over 1000 Mb.